It is with immense pleasure that this month’s blog entry is going to be a long and pretty thorough update on what I’ve programmed into URR in the last little while. As many of you readers will know, the latest version – 0.8 – has been about 90% done for over a year, until I restarted development, slowly, a month or two ago. It is now sitting at somewhere around 95% or so, I would say, although I have also reduced the scope of the remaining 10%, so that I can just get it released as soon as possible – if there is a 0.9, I’ll return and fill in the blanks then with a much smaller release. 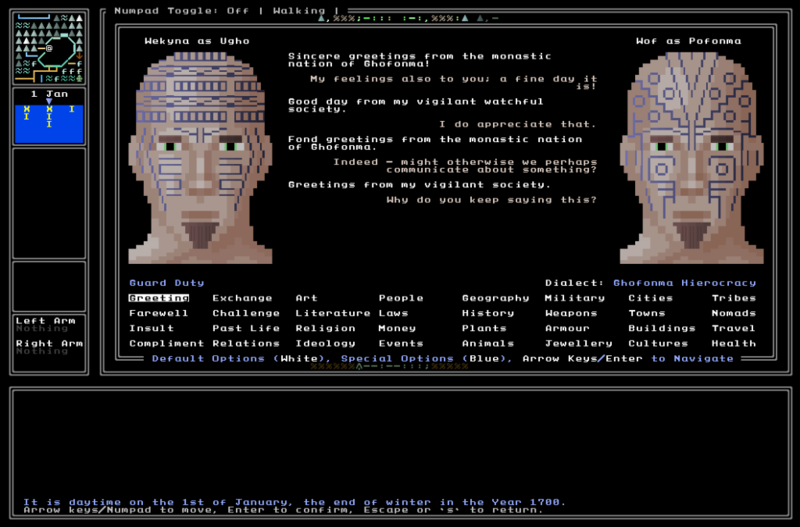 – Names of artworks now generate, and NPCs can talk about them. 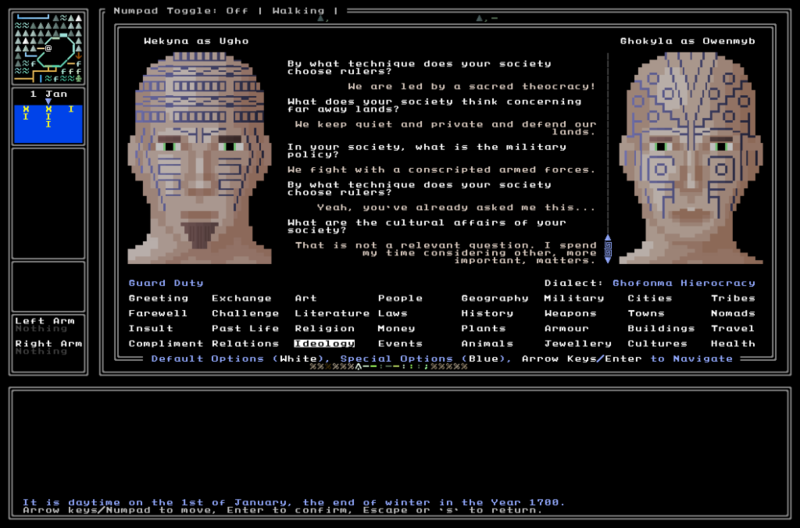 – Names of books and poetry now generate, and NPCs can talk about them. 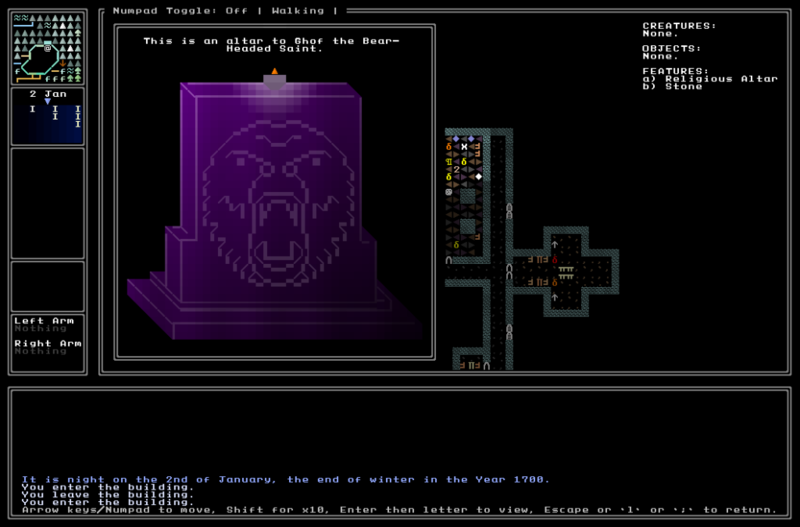 – Names of relics now generate, and NPCS can talk about them. – Everyone can name and talk about the rulers of their nations. – Friendly NPCs will warn you to be wary when asking potentially sensitive questions. – Rulers have appropriate titles and sets of roles and responsibilities. – Asking a soldier or officer about their job no longer results in a crash. – Removed the ability for the player character to change dialect; if implemented, this will be a 0.9 feature. – Monks and abbots can tell you about the history of their monasteries and what they produce. – NPCs can tell you appropriately about their past, their upbringing, etc. – Servants and slaves correctly discuss whoever they serve. – Officers tell you about their histories and how they were promoted. – Shopkeepers will tell you what they have in stock (for, er, once they have items in stock!). – Removed the possibility of NPCs recommending you talk to someone else (i.e. an expert on the topic you’ve asked about) instead of them; again, if implemented, that’ll be 0.9. – The mood of NPCs talking to you declines more slowly than before, even if you ask them daft things. – NPCs can talk about their current and past jobs, and their backgrounds and origins. – Guards will tell you about what they guard, who they guard it for, who is allowed in, and so forth. – Mercenaries will give you ample information about their skills and abilities if asked. – Relevant NPCs have lots of information about their religions, holy books, festivals, and so forth. – Military figures will tell you about their armed forces (if appropriate). – Mercenaries, military figures and other relevant NPCs can tell you about weapons, armour, how their people fight, etc. – NPCs can talk about travel, where they’ve visited, where they were born, where they grew up, etc. – Farmers can tell you about farming (which, I’m sure we’ll all agree, is absolutely vital). – Innkeepers and jailers tell you about their jobs and the histories of their taverns or jails. – Various titles for rulers and religious leaders and the like are handled correctly whenever an NPC needs to talk about them. – Prisoners will tell you all about their crimes (which they may well insist they didn’t commit, of course), when they were imprisoned, and when they will get out. – NPCs can tell you about the plants and animals found in their areas, and what plants/animals (if any) might be sacred to their people. – Handled a number of broad answers for big questions, which now serve as placeholders until more detail can be added. – Checked that a number of bugs relating to speech patterns have been fixed. 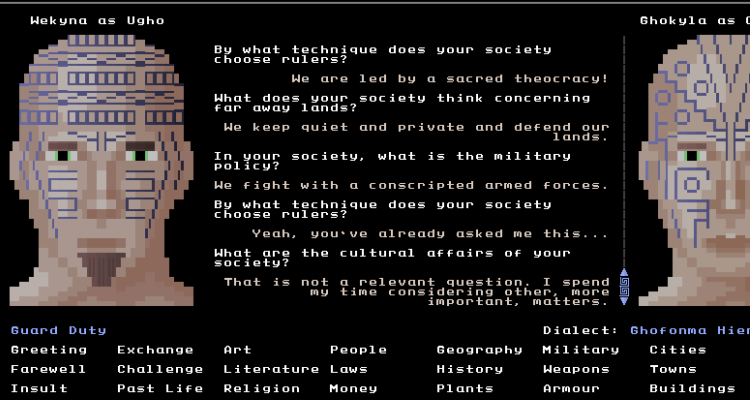 – Added a lot of new information about civilizations and religions that NPCs can talk about, mainly preferences for/against certain things. Where does this leave us? Well, the conversation system is more complete than ever, and more bugs have been fixed. As before, I’m now not giving deadlines or anything, but the 0.8 version of this mad sprawling worldbuilder is finally on its way in the not-too-distant future. More soon! Wow, that’s quite a list of changes. I particularly like how NPCs will get annoyed if you ask them questions they don’t like. You certainly have put a lot of work into it over the past year, and I’m looking forward to seeing the results. Thanks crowbar! Me too, it’ll be such a relief to finally get 0.8 out. Congrats on slowly getting back on the game coding horse. And damn that is an impressive list. I see this long post and I react with a short comment : this is freakin’ amazing! Damn, sounds great. Been a few years since I have checked in on this and I’m glad I saw a tweet about it. I’m going to have to check it out more when I get home. Thanks Chris! Nor can I – it’ll feel so good to finally get all this work out there. This is the best news I’ve seen all year! Congratulations!!! Aw, thank you Paul!! It feels damned good. I’ve been checking your site every month or two for updates on URR. Glad about your progress. Do you intend to get to 1.0 eventually, some day? Thanks Alda! It depends; I’m really enjoying coding again, but I’m also trying to be realistic about time, workload, etc. If there are future versions they will be *FAR* smaller than 0.8, and far smaller than planned, and much more like gradual iterations than huge content updates like this one. We’ll see! Owwww I missed these two updates ! It’s an impressive list of changes and fixes, congratulations. This is a truly amazing peice of work. The amount of dedication and sweat you’ve put into this is just astonishing. I’ve been keeping up with URR for almost a year and a half now (plus reading old posts too), and am cheering you on every step of the way. Thank you so much for this message! You’re very kind, and I really do appreciate it a ton :). You’ll have to let know what you think of 0.8 once it’s finally done!